When Decker drags his best friend Delaney’s lifeless body out of the frozen lake, he makes a deal: Anyone but her. Everyone but her. The lake releases her. It takes another . . .
All their friends blame Delaney for Carson’s death. But Decker knows the truth: Delaney is drawn to those who are dying, and she would have tried to help Carson. Or so Decker believes until a body lies in front of him in a pool of water on his kitchen floor. Until he sees in Delaney’s eyes that she knew this would happen too – and she said nothing. Until he realizes it isn’t the lake that is looking for revenge – Delaney is part of someone else’s plan. This powerful and emotionally charged psychological thriller follows Megan Miranda’s stunning debut Fracture. I haven’t read the first novel in this series, but Miranda does a great job keeping the reader on track, giving just enough information that we understand what went on in the first novel so we’re able to stay on top of everything in this second novel. I never felt like I was missing information and, while I do plan to go back and read book one eventually, I don’t feel like it is a prerequisite in order to read this second installment. 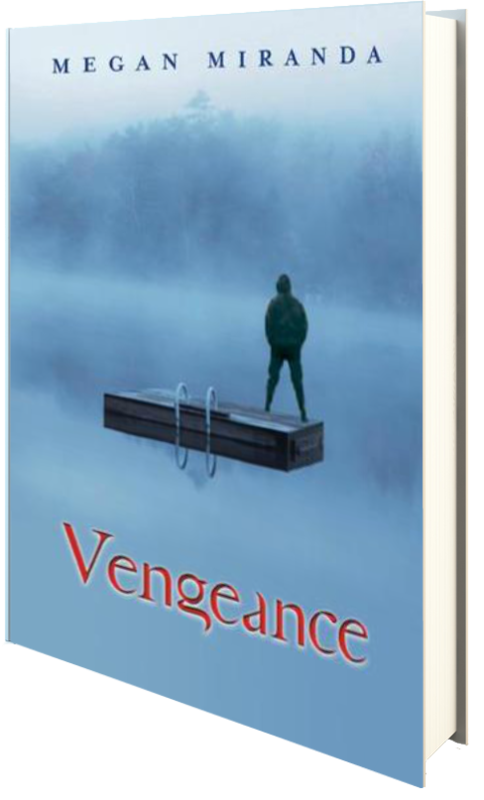 Whereas the first novel details the budding relationship between Decker and Delaney, Vengeance does just the opposite. With the death of an immediate loved one at the start of this novel, Decker begins to harbor an extreme hatred for Delaney, thus, breaking up their perfect relationship. Quickly dropped by the only person who really understands what happened to her on the ice at the end of book one, Delaney forges on, trying to find her place in the world while Decker trys to forgive and get over this monumental “betrayal,” as he sees it. And if the demise of Decker and Delaney is not difficult enough for the pair to endure, someone or something is terrorizing Decker and his group of friends—and won’t stop until more lives are claimed. I really liked the mystery within this novel, and I never saw the truth coming. I think Miranda did a great job pulling it all together, and I loved the ending. But, I did find the novel a bit slow towards the middle of the book. While I understand Decker’s hang ups and feelings after an immediate family member dies, I felt like there was a little too much time spent on his and Delaney’s relationship and less on the action sequence that entices the reader forward. Suddenly, the actions seems to stop and it’s touch and go in the relationship department, and while I do understand that Decker and Delaney need to clear the air in terms of their relationship, I found myself wishing more was happening in terms of the mystery. I wasn’t a fan of Decker’s obsessiveness and his indecision, and I would have liked that section to be paired down so there was a little more focus on the mystery aspect of it all. But that might just be me. Overall, this was a very good read, and I can’t wait to read the prequel. Three and a half stars. Bloomsbury USA Children’s Books and Walker Childrens have been extremely gracious in allowing me to read an ARC of this novel, via Netgalley, prior to its release on February 4, 2014. Wow, that’s very interesting. I had no idea you didn’t have to read Fracture in order to read Vengeance. I was surprised when Megan was going to write a sequel. I very much enjoyed Fracture so I’ll definitely pick this one up. Great review!